The Ministry of Labor in the Kingdom of Saudi Arabia has just now come out to explain the different facts behind a video which had been circulating on various social media platforms. The video in question showed two male expatriate workers along with a woman inside a commercial center in the Kingdom and acting in a highly inappropriate manner. The Ministry of Labor confirmed firmly that the incident and also the video showing the incident are both outdated. The Ministry added that all those who had appeared in the video acting in an inappropriate manner have been deported from the Kingdom and also have been banned from entering the Kingdom of Saudi Arabia again. The media spokesman for the Ministry of Labor, Khalid Abalkhail has stated in a press statement aimed at the local media in the Kingdom, that the Ministry of Labor has conducted several various investigations over the last few days in order to reach the truth behind the actual video. The spokesman Abalkhail has stated that the Ministry of Labor has found all the expatriate workers who had been involved in the video and have been found to be of Arab nationality. The shop where this video was shot and the indecency took place is inside a commercial complex which is located in Riyadh. 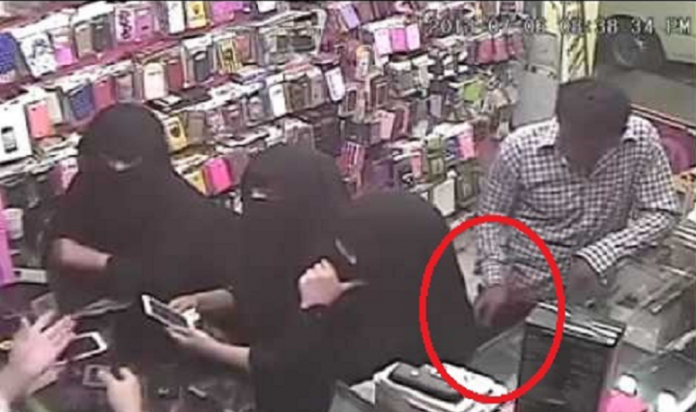 The woman in the video is a very frequent customer of the shop where this happened, and the actual incident dates back to Shawal 1435. The official case had already been documented in the official records of the concerned authorities which are concerned with these kinds of cases. The spokesman also added that the company who actually owns the shop had immediately reported this incident at the time, which led to all the three involved in this indecent behavior, had been deported from the Kingdom and have also been banned permanently from entering the Kingdom of Saudi Arabia. He also confirmed that the Ministry of Labor has put in place various regulations and conditions which have mandated all establishments have to organize their respective work environments and develop upon it. This is a direct indication that the Ministry of Labor does in fact continuously conduct a round of inspection in order to ensure the commitment of the employees and the establishments to the regulations which have been imposed upon them. They also imposing penalties and fines upon any and all violators, which includes the deportation and ban on workers who are in violation of the regulations set by the Ministry of Labor. The spokesman has called upon all the citizens of the Kingdom of Saudi Arabia to come out and report any and all violations of the regulations and laws as well as any irregularities which they might see.